Hello, my lovelies! I'm typing this from sunny southern Florida and loving it immensely! Right before I left, I received the Milani Texture Collection in the mail. So I decided that I needed to try out these brights before I left for Florida! First up is Yellow Mark, a sunny yellow cream texture. This was with two coats. As you can tell, this is a little grainier than the textures we've seen from Zoya. Side shot! Next is Aqua Splash, a turquoise cream texture that reminds me so much of summer I can't stand it. Also, two coats here! Here's Shady Gray, a charcoal gray cream texture. Also two coats. Spoiled in Fuschia, a bright magenta cream texture is next. I loved this color! Tainted in Red is a bright tomato red cream texture. It was a little hard to photograph because of how in-your-face bright it was. But it is a great shade. Last, but not least, as it's my favorite, is Purple Streak. This is a rich violet cream texture and I loved the pigment in this. It's a great color. Overall, I think these are some great colors here. They're bright, in-your-face, and definitely perfect for summer. Opaque in just two coats. Also, the texture on this is a little bit easier to deal with, as it's not as gritty as the OPI Liquid Sands or Zoya Pixie Dusts. It's much smoother, so it shouldn't snag on clothing as much. The removal of these shades was a BREEZE. And that's a huge plus! That being said, I just can't get on board with texture. It's just not me. But these would probably be as close as I could wear happily. 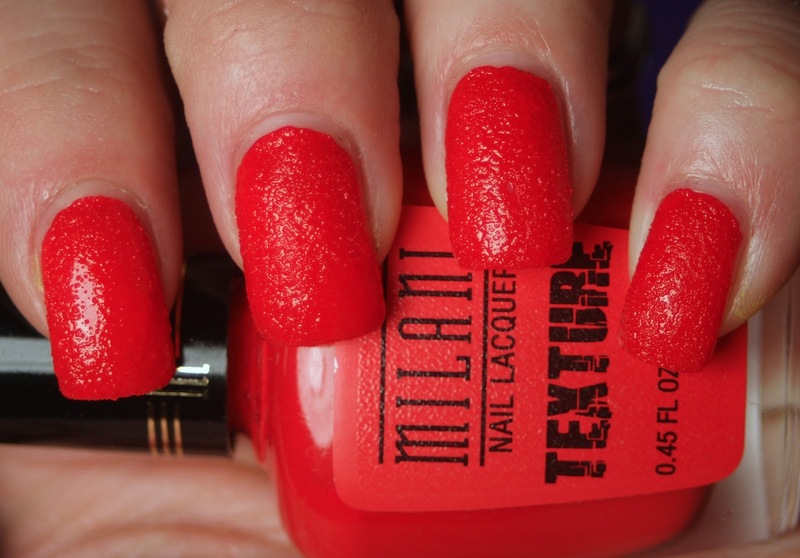 The Milani Texture Collection is available in stores now for $4.99 for a 0.45 oz bottle, as well as online. These look cool on your names but I'm not sure if I'm brave enough to try them :) Also, I just have to say that I love your banner!